Like a party? Then you've come to the right place. The home of Mardi Gras and the birthplace of jazz, NoLa has some of the best nightlife in the US. Perched on the banks of the Mississippi River, New Orleans is the largest city in Louisiana, and boy is it fun. Explore the historic French Quarter, visit the National World War II Museum, or take a swamp tour of the Louisiana bayous. Book a New Orleans vacation rental in the CBD or the French Quarter and have Bourbon Street, the heart of the city's party scene, right on your doorstep. The highlight of the New Orleans calendar is, of course, Mardi Gras. Fat Tuesday is held for 2 weeks in February when the city is alight in a blaze of color, music, and good cheer. But it's not the only draw to the city. Explore the historic French Quarter, take a paddle steamer cruise on the Mississippi, or head to Uptown and the funky shops, antique stores, and art galleries of Magazine Street. 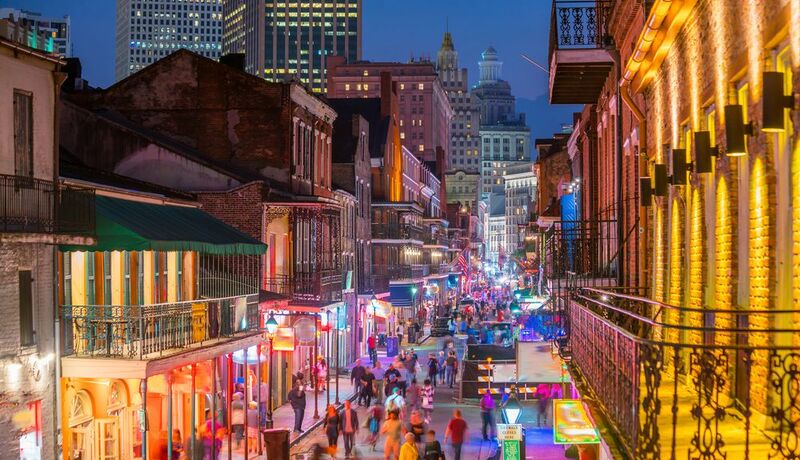 While night owls should book a New Orleans vacation rental within easy reach of Bourbon Street, the epicenter of the city's jazz clubs and nightlife. New Orleans is one of the most visited cities in the US. The busiest time to visit is spring, from February to May, when it's dry and a pleasant 65-70 degrees. Of course, it's Mardi Gras season, when New Orleans vacation rentals get booked up far in advance. Summer is the low season, as the steamy tropical temperatures rocket to 90s and humidity is high. Come fall, the temperatures ease up a little to around 75 degrees, although this comes with threat of hurricanes. Winter is cooler still, with highs around 60 degrees, so pack a jacket. Perched on the banks of the Mississippi River, New Orleans is a sprawling city near Louisiana's stretch of the Gulf of Mexico. A 30-minute drive northeast of the city is the Bayou Sauvage National Wildlife Refuge. At 23,000 acres, it's the largest urban wildlife refuge in the US. A popular birdwatching spot, the refuge is home to the endangered brown pelican, bunting, and bald eagle. The bayous are an iconic sight of Louisiana, and its wetlands are filled with largemouth bass and catfish. Take a swamp boat tour and spot a wealth of wildlife, including alligators and marsh rabbits. Fly into New Orleans, LA (MSY-Louis Armstrong New Orleans Intl. ), the closest airport, located 11.5 mi (18.5 km) from the city center. If you prefer train travel, the main station serving the city is New Orleans Union Passenger Terminal. Where to stay around New Orleans? Our 2019 property listings offer a large selection of 2,771 vacation rentals near New Orleans. From 1,118 Houses to 1,323 Condos/Apartments, find a unique house rental for you to enjoy a memorable stay with your family and friends. The best places to stay near New Orleans for a holiday or a weekend are on HomeAway. What is the best area to stay when traveling to New Orleans? What are the popular points of interest near where I can stay when traveling to New Orleans? But there are many other points of interest around New Orleans listed on HomeAway where you can find your place to stay. Please use our search bar to access the selection of vacation rentals available near the point of interest of your choice. Can I rent Houses in New Orleans? Can I find a vacation rental with pool in New Orleans? Yes, you can select your preferred vacation rental with pool among our 409 vacation rentals with pool available in New Orleans. Please use our search bar to access the selection of vacation rentals available.